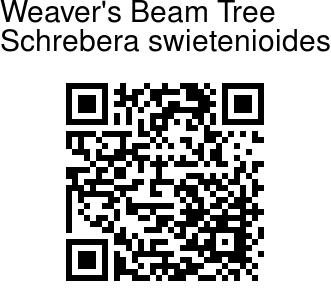 Weaver's Beam Tree is a moderate sized deciduous tree, growing up to 20 m tall, with thick grey bark. Leaves are pinnate, with 3-4 pairs of opposite leaflets, and a terminal one. Leaflets are ovate, entire, unequal-sided, petioles thickened at the insertion of leaflets. 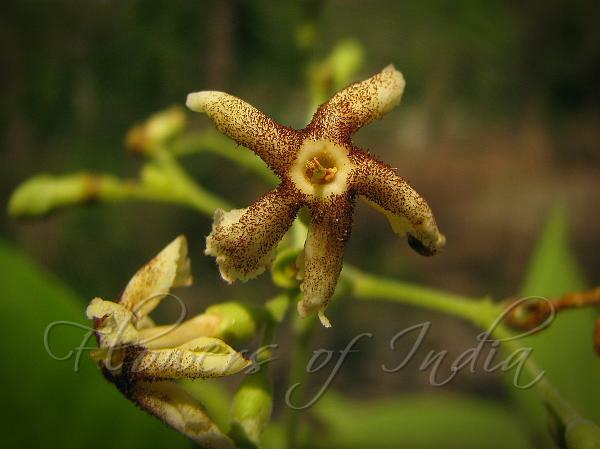 Flowers are yellowish white, variegated with brown, in terminal trichotomous, corymb-like, compound clusters. Flowers are fragrant at night. Flower tube is funnel- shaped, 8-12 mm long. Petals are 5-7, widely spreading, wedg-shaped, blunt, with brown glandular raised dots on the upper side. Capsule is the size of a hen's egg, pear-shaped, woody, hard, scabrous, 2-celled, seeds 4 in each cell, pendulous, irregularly oval, compressed, produced into a long membranous wing. The wood is used by weavers to make the beam of the looms. Flowering: February-April. Medicinal uses: The roots, bark and leaves are bitter, acrid, appetising, digestive, thermogenic, stomachic, depurative, constipating urinary astringent and anthelmintic. The fruits are reported to be useful in curing hydrocele.